When you have to make a unique lyric for as ringtone or merge the MP3 files for free of cost, you may require MP3 joiner or best audio recorder software. There are a huge number of audio recorder programs in the market. A number of audio recorder software can do more than just recording job. Whenever you are looking for best audio recorder software, always remember to check its functionalities and check whether it supports several different file formats or not. If it only supports 2 or 3 formats then don’t go for it. A good audio recorder allows its users to record online music and then save it to their PC. This must be kept in mind while picking audio recorder as sometimes you like a song or ringtone on online music forum and want to listen it later as well. So, a audio recorder will allow you to record it and enjoy it later. Whenever you are looking for audio recorder software then always check that there are no charged to use it as well as it is safe to use. 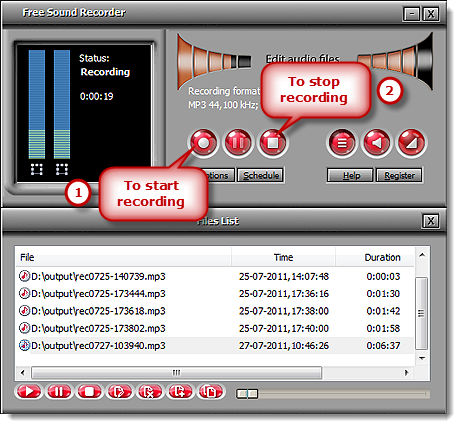 Free Sound Recorder catches all the music played by the PC including web streaming audios. The software can easily record the sound from different apps, for example, RealPlayer, Windows Media Player, Jukebox, Win Amp, web communication programs such as Skype and numerous others. Free Sound Recorder can record such audio with top quality for its unique virtual sound driver. How to use Free Sound Recorder? 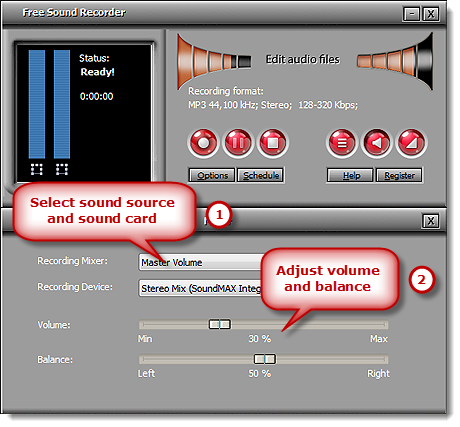 Using free sound recorder is easy and simple and below we have listed some steps that will tell you how to use it. Launch the Free Sound Recorder and then click on the button named as Show mixer window to pick audio source from Recording Mixer list. There’re numerous kinds of audio source such as Phone Line, Stereo Mix, Video Volume, Aux Volume, Line In, Mic Volume, CD Audio and much more. After that, choose a proper recording tool from the Recording Device menu and regulate the volume as well as the balance of the audio file. Now click on the Options to set off the options window. In the General Settings tab, you can specify the output format of the file among MP3, WMA, WAV, and OGG. After that click the Settings to use the configured presets or indicate configuration parameters to alter the quality of the recording. Now click on the Change option to choose the output folder for the file. Lastly click on the Start recording button to start the recording procedure and click stop recording button to stop. 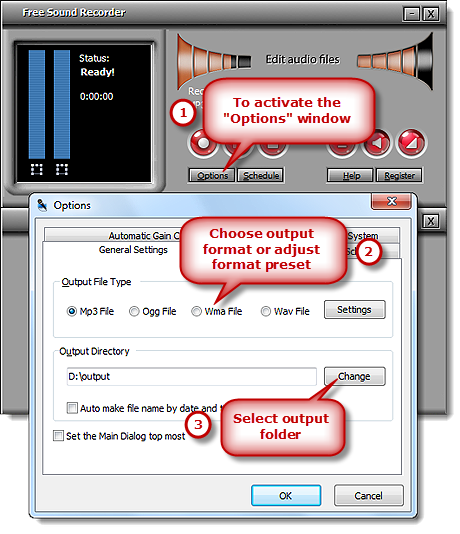 The recorded audio will be straightforwardly output to output folder and listed in file list with the detailed info such as filename, time, location, and duration. The recording can be played using the built-in audio player. If you are looking for the software to help you to record the audio files then you won’t be dissatisfied with the Free Sound Recorder program.